Twelve years ago, Pete Kirill graduated from The School of the Art Institute of Chicago with a bachelor’s degree in fine art and design. However, a year before his graduation, he voyaged to Cuba, where he collaborated for three years with music collective Sin Palabras. It was there, on the tepid island, specifically while traversing the historic streets of Havana, that the Alabama born artist found inspiration for his ongoing art series; a creativeness that grew within him after having viewed firsthand the drawbacks of communism as well as their parodoxical link to commercial marketing. Kirill’s tenure in a country propelled by communist propaganda is the source for his latest collection: A Dictator Visits Miami. With categorical understanding, Kirill’s work juxtaposes communism and capitalism with a sly undertone of humor. This is not the first time Kirill has painted works that seem to mix irony, surrealism and realism, into one whole entity. While in art school, he took to painting iconic cartoon characters as real individuals. One such painting titled Bart the Junkie depicted Bart Simpson, from the longest running cartoon show The Simpsons, as a heroin addict. While communists have been coupled with Western artwork in the past, none have visited Miami. Moreover, few have exuded American gaudiness and drawn the lines of communism and capitalism so thinly like those presented in Kirill’s work. In his new series, Kirill’s muses, dictator leaders like Fidel Castro and predominantly Kim Jong-il, visit America by participating in luxuries that contrast the communist ways. Though such ideas might go against political ideology at first glance, according to Kirill, they aren’t totally far-fetched; stressing further that communist propaganda has numerous similarities to celebrity propaganda — a practice that makes the individual an iconic figure through the use of governing marketing strategies. Contemporary art that holds a strong emphasis on social and political aspects (oftentimes international), such as Kirill’s work, can seem at odds with a public that doesn’t immediately connect with the undertones and subtle meanings of a classless society’s viewpoints. Therefore, to create a better understanding and correlation for the modern individual, Kirill takes communism from the news screen to the silver screen with art that mixes foreign nostalgia with iconic American figures. Exclusively for GALO, the artist who found inspiration in an unlikely place reveals why dictators make great muses, and why one particular dictator intrigued him. GALO: Politics and celebrity culture while opposites seem to be converging more than ever in the 21st century. In A Dictator Visits Miami these elements appear to be very dependent on each other. Did you mix these components because of the times we live in or was there a deeper significance to it than just that? Pete Kirill: Yes, there has been an emerging theme of artists mixing politics with celebrity culture. We can see this theme in some of the pop works of Andy Warhol. Andy Warhol’s famous portraits of Mao Zedong portray the Chinese Marxist leader in the same bright and colorful fashion he uses to portray Marilyn Monroe, Muhammad Ali and Michael Jackson, drawing parallels between communism and capitalism. We also see a similar theme, although reversed, in the works of Shepard Fairey. Shepard Fairey’s famous piece “Giant,” portrays wrestling legend and Hollywood celebrity Andre the Giant as a Marxist leader, similar to the way Soviet propaganda artist Dmitry Moor portrayed Stalin. As a contemporary artist living today, one can’t help but be influenced by these works in some way, because the imagery is everywhere and has become a part of pop culture. Although I have seen and studied these and other similar artists’ works, they are not the reason why I began mixing these two ideologies on canvas. I became interested in this idea from my experience living in Havana, where I was able to see the propaganda machine of the Castro regime first hand. 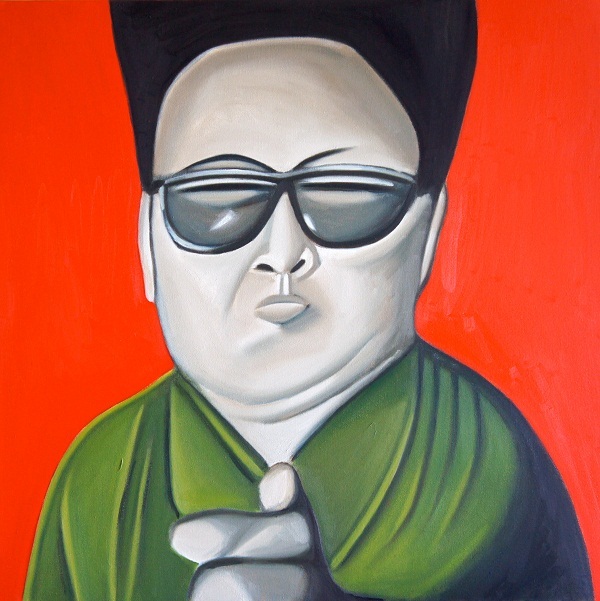 “Kim Land,” 40’x 30′, 2010, by artist Pete Kirill for his “A Dictator Visits Miami” series. Photo Credit: Pete Kirill. GALO: With all the living dictators from Fidel Castro to Omar al-Bashir, why did you choose Kim Jong-il as your muse? What experiences in your past contributed to the creation of this series? PK: From 2000 to 2003, I collaborated with a Cuban music group in Havana. During my time in the country, I became fascinated by the overwhelming presence and graphical style of communist propaganda that is seen everywhere. Larger than life portraits and murals of Fidel Castro and Che Guevara covered the city, and to me resembled retro style Hollywood movie posters. That connection fascinated me and inspired me to research and study propaganda posters from other communist states, and led me to research the secretive state of North Korea. 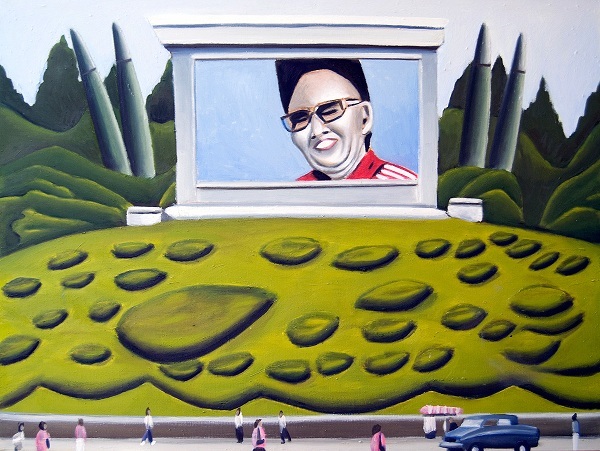 I became particularly interested in the portraits and murals of Kim Il-sung and Kim Jong-il and the way they are portrayed as likable God-like figures, similar to the way film and music celebrities are portrayed by Western media. The parallels between dictator worship and celebrity idolization was something I wanted to explore visually. GALO: While we often only see the calculated political dealings of dictators, their personal lives are often very guarded. What did you learn about the dictator and communism that helped aid you in creating this series? PK: For the past three years, I have been very interested [in] reading information about Kim Jong-il and the Democratic People’s Republic of Korea (DPRK). What I have learned about Kim Jong-il’s regime and other communist states is that there is hypocrisy between the ideologies that are taught to the citizens and what is actually practiced by the people in power. Since the collapse of the Soviet Union in 1991, North Korea’s economy has suffered dramatically. And after Kim Jong-il succeeded his father as ruler in 1994, his foreign and domestic policies have isolated the country from the international community, leaving the economy devastated. North Korean citizens do not have basic human rights or freedoms and live in extreme poverty. This was also evident in Cuba, from my experience living there. While the citizens struggle to eat and bear the daily hardships that have resulted from the communist revolution, the ruling elite live in luxury, enjoying all of the fruits of Western culture that are forbidden to their citizens. 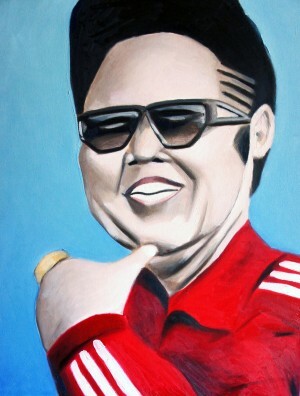 “Uncle Kim,” 30″ x 40″ oil on canvas, 2011, by Pete Kirill for his “A Dictator Visits Miami” series. Photo Credit: Pete Kirill. Kim Jong-il was one of Hennessey’s biggest consumers, reportedly spending more than $800,000 on cognac a year. It is also reported that he likes to eat a particular herb-scented rice cake from Tokyo, calculated at about $120 a bite. Also a fan of fashion, he sported a bouffant hairdo, and liked wearing designer sunglasses. This luxurious lifestyle enjoyed by Kim Jong-il and other communist dictators is very similar to the lifestyles we see of famous Hollywood celebrities. And it contradicts the philosophy of communism, which is the idea of a free society with no division or separation, and where people are free from oppression. This contradiction that is seen in Kim Jong-il and other communist dictators interested me, and combined with my observations in Havana is translated in this series.